Casa Palmera is a single level detached villa on the edge of La Cala in the exclusive Urbanization of El Chaparral. It has secure gated private gardens with partial sea views and a private pool. The rear garden, terraces and pool are all south facing and the villa gets the sun all day. La Cala's many restaurants, bars, chiringuitos, shops and the twice weekly market are only a 10 minute walk away. 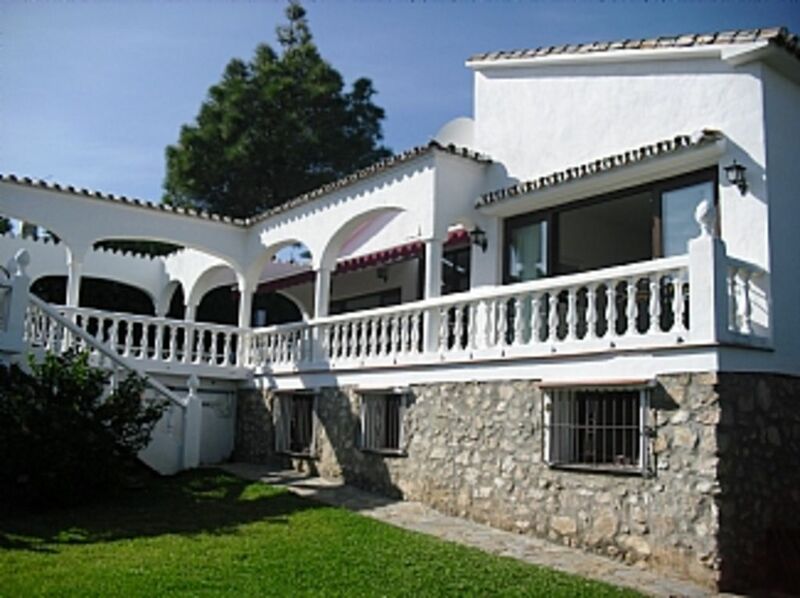 La Cala is a lovely fishing village that boasts lots of Spanish charm and has every facility. There are 2 large supermarkets and a number of banks and gift shops. La Cala beach is a blue flag beach, with lovely clean golden sand where you can hire sunbeds and parasols. The house is on a golf course and there are numerous other golf courses in the area to choose for the golf lover. The horserace track (Hippodromo) is 1/2 km from our villa and is a fantastic evening out. My wife and I live and work full time in Ireland but visit La Cala at every possible opportunity. We are to keen golfers. We are members of El Chaparral Golf Club. We bought in El Chaparral because family members have owned villas there for nearly 40 years. We love the area because El Chaparral is so peaceful and relaxing yet a short walk or drive to all the attractions of the coast. We feel we are at the centre of things but still hidden away in a quiet oasis when we want to unwind. The villa is a 5 minute walk to the beach and only 10 minutes on foot to some of our favourite restaurants, chiringuitos and tapas bars in La Cala. As the villa is all on one level the desire to just walk from the living room and bedrooms out to the pool and cool off at any time of the day is hard to resist. En suite to bedroom 1 with jacuzzi bath, double sinks, walk in shower, WC. En suite to bedroom 2 with shower, double sinks and WC. The living room is furnished with a large corner leather sofa . Air conditioned. Open log fire, TV, DVD, wifi, iPod docking station. Doors to pool. It is open plan to the hall leading into the dining room. Sky and standard UK/Irish TV channels available. The villa is around 2 hours drive from the Sierra Nevada which enjoys fabulous skiing in the winter months. You could be skiing in the morning and sun bathing on the beach in the afternoon. At Christmas we have enjoyed sun kissed beach lunches looking back at snow capped mountains! El Chaparral golf club, a 3 minute drive through the urbanization, is one of the most prestigious and challenging courses on the coast. The club house enjoys fabulous sea and mountain views with friendly staff and great food for even the non golfer to savour. It is definitely worth a visit to sip a few drinks while the sun sets over the mountains. The villa is in the heart of "golf valley". The following golf clubs are literally within 10 minutes drive - Santana, Mijas (2 courses), La Cala (3 courses), La Noria, Cerrado Del Aguila (fabulous clubhouse and terrace), Cabopino, Miraflores, Calanova. A few kms further down the coast at least 20 other courses are in reach. Golf brochures and directions to all courses available in the welcome pack. Notes on accommodation: Travel cot and high chair provided in the villa. Hairdryer, Hair straighteners, Books, Sewing and First Aid Kits and some toys are provided. Iron, ironing board, pegs and airer. All located in the hall cupboard. The gardener comes once a week and looks after the pool. Outside: South facing terraces extend the full length of the property. There are sliding doors leading from the living room, dining room and master bedroom onto the terraces. The terraces and pool have partial sea views. There is a lounge seating area with colonial rattan furniture at the end of the pool which gets the sun all day and affords lovely views over the pool and back to the villa. Particularly special when the villa is lit up at night. The garden terrace has a built in bbq with dining table and chairs as well as matching ratan lounge furniture to catch the sun all day. There are several areas of the garden where one can enjoy the sun on all 4 sides of the property. There are gated steps which lead from the pool area to the large gardens. There are 2 large awnings which extend over most of the terrace for more shaded moments during the day and additional atmosphere at night. Outside lighting and the pool light create a chilled ambiance as well as providing additional security. Cleaning / Towels / Linen / Maid service: All linen and bath towels are provided.Clean linen changes are available in the villa. Beach towels are not provided. Cleaning service prior to your arrival and on departure. Additional cleaning can be provided if required and is payable locally. Other: The dining table seats 6 or extends for 8. Doors leading to terrace. There is also a safe in the villa. Excellent Comms from Conor and Fiona, the villa was exactly as expected and fully equipped. Easy access and great location, 15 minutes walk into La Cala and an easy drive to most places on the coast. We had a great stay in La Cala and will definitely return. Lovely casa. Very well equipped. Great location for malaga, marbella, minas and antiquera. Everything you need for an enjoyable holiday. Conor was really helpful and gave good information. Fantastic villa - spacious, well equipped and secluded. All the other reviews for this villa are spot on - I cannot recommend highly enough. My husband and I rented this villa with friends for a week in Marbella. The villa was excellently equipped, there was everything we needed, it was very clean and modern. There was a very good welcome pack which included Prosecco and beer. It was a bit far out from Puerto banus and Marbella old town and we spent a lot of euros in taxis, but that was the only niggle to this lovely villa. It was secure and completely private. We would thoroughly recommend this lovely villa. The beach is 5 minutes walk away and runs all the way from El Faro restaurant in the east to the luxurious Oceano beach Hotel & restaurant in the west. For the fitter amongst you the soft sand makes a hearty hike for around many miles. The nearest beach bar is The Sheriff's Bar with sunbeds and parasols, great food and relaxing music. La Cala beach is award winning & has an abundance of chiringuitos and beach bars including our favourites of Arroyo and Papa O's. Malaga airport is 25 minutes away. Fuengirola is a 10 minute drive whilst Marbella and Puerto Banus are no more than 15 minutes. Walk 5 minutes and hop on a bus to Marbella or cross the road to head in the opposite direction to Fuengirola. The high speed Renfe trains from Fuengirola will have you in cental Malaga in 30 minutes and Madrid in 2 hours 20 minutes. Car hire not necessary but easily available at Malaga airport and in La Cala. Taxi rank in La Cala centre 24 hours. Granada, Ronda, Seville Gibralter and Cordoba all within 2 hours drive. Mijas, a typical pueblo blanco at the foot of the hills of the same name, possesses beautiful Andalusian houses. It's traditional status as a mountain village makes it well worth a visit and only 15 minutes away by car. La Cala has a twice weekly open air market. There are multiple banks, coffee shops, internet cafes and great supermarkets. It has retained it's fishing village atmosphere combined with modern conveniences to suit all tastes.The Feria at the end of July is spectacular for all ages. The Miramar shopping centre outside Fuengirola is a must, with free parking, family friendly facilities, english speaking cinema, great selection of shops of all varieties with bars & eateries. La Canada near Marbella has in excess of 280 shops, is easy to find, just off the main road & even has an M&S. For the uninitiated Puerto Banus marina is worth a visit & El Corte Ingles department store has shopping galore. Marbella's golden mile and old town are 15 minutes away by car & it's Orange Tree Square has a wonderful selection of restaurants to wile away a sunny afternoon. Selvo theme park , Sea Life acquarium, Bio Park, Benalmadena Cable Car & Marina and the Aqua park (to name but a few) are all within 10 minutes drive. There is a fun boat trip from Fuengirola to Benalmadena marina which is worth a change of scene for the day. Fuengirola's recently renovated 5 mile promenade is the longest in Spain & great for bikes, roller blades or just a stroll. Details of where we think are the best places to visit, golf, eat & drink etc are in our welcome pack. Booking Notes: All bookings must be accompanied by a non refundable deposit of 25%. The final balance is payable 8 weeks before departure. There is also a £250 damage and security deposit which is payable along with the balance 8 weeks before departure and subject to there not being any breakages/damage beyond normal wear and tear will be refunded within 7 days of vacating the property. Payments can be made by bank transfer or cheques in stirling or euros (rate to be agreed). Changeover Day: Changeover days are flexible. Check in after 4pm, check out before 11 unless otherwise arranged. If there is no booking either side of your stay early arrivals & late departures may be possible. Notes on prices: Prices for the property are per week in UK pounds. Discounts are available for bookings over 2 weeks.